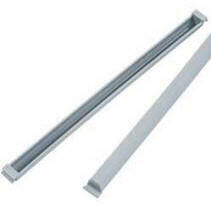 Provides side to side filing. 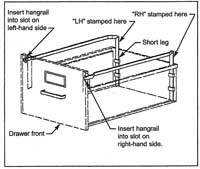 Old Style hangrails were used on all HON lateral files produced before April of 1994. The ends of the rails look like an "L" shape and the slots in the sides of the drawers that accept the rails are a thin rectangular shape. Specify cabinet size: 30", 36" or 42" exterior width. Quantity Discounts available. New Style hangrails were used on all HON lateral files produced after April of 1994. The ends of the rails are more solid and have a small notch cut out to fit into the drawer slots. The slots on the side of the drawer that accept these rails are "b" and "d" shaped depending how you are viewing. Specify cabinet size: 30", 36" or 42" exterior width. Quantity Discounts available. For Front-to-Back Filing in a 42" wide cabinet. in a 30" or 36"" wide cabinet. 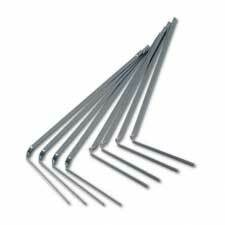 Overall Length is 15-1/2"